If you purchased a Skype for Business Online Plan, you may want to add more people to your plan. When you purchased a Skype for Business Online Plan, you created an Office 365 user ID at the same time, even though you didn't purchase Office 365. 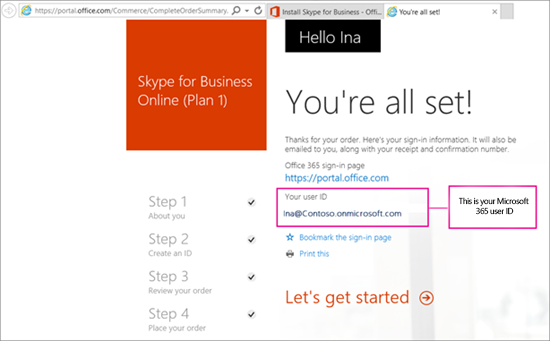 Using your Office 365 user ID, sign in to Office 365 at https://portal.office.com/. Then follow the instructions to add users to Office 365, only in your case, you'll be adding them to your Skype for Business Online subscription and not an Office 365 subscription.